1.In large covered saucepot, heat potatoes and enough salted water to cover to a boil over high heat. Reduce heat to medium-low; simmer, uncovered 15 minutes or until potatoes are easily pierced with a knife. Reserve 2-1/4 cups cooking water; add butter. 2.Drain potatoes; return to saucepot. Add cheese and 1 teaspoon salt; mash with potato masher until well combined. 3.In large bowl, stir flour and remaining 2 teaspoons salt. Gradually stir in cooking water-butter mixture until dough forms; you may not need to use all of the water. 4.Transfer dough to work surface; knead dough 5 minutes or until smooth. Cover dough with plastic wrap and let stand 10 minutes. 5.With rolling pin, roll dough 1/8-inch thick; cut out circles with 4-inch round cutter or glass. Gather scraps; re-roll to cut additional circles. Place about 1 tablespoon potato mixture in center of each circle; dip brush in water and lightly run along 1 side of dough circle. Fold dough over filling; press edges together to seal and place in single layer on cookie sheet. Repeat with remaining dough and filling. Makes about 45 pierogies. 6.Heat large saucepot of water to a boil over high heat. In batches, add pierogies and cook 8 minutes or until edges of pierogies are cooked through; drain. 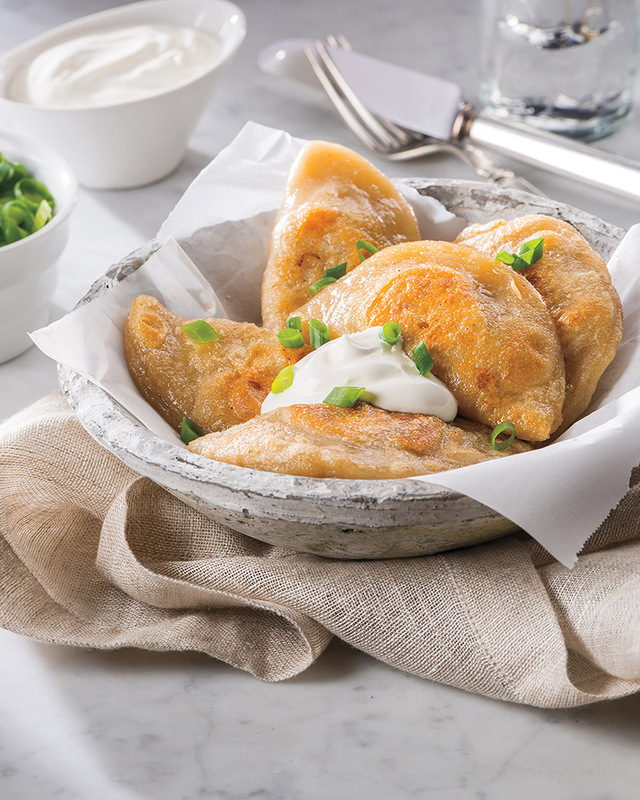 Toss hot pierogies with butter and serve topped with sour cream and green onions, if desired. Filled pierogies can be frozen in single layer on cookie sheets, then transferred to zip-tight plastic bags and frozen up to 6 months. Cook from frozen in boiling water as directed in recipe. > Swap all-purpose flour for whole wheat flour for a fiber boost. To reduce the total carbohydrates, reduce the amount of mashed potatoes you use and add in mashed cauliflower as a substitute. Simply steam cauliflower and add to the pot to mash with potatoes, cheese, and salt.